The museum was opened officially on August 24, 2005, in an empty storefront in a small shopping plaza along Broad Street. The former home to a local salon, the space was best known as being the original location for Oriental's "Town & Country" grocery, and as a result, many local downtown store and restaurant staples from 50+ years ago are proudly on display. The majority of the items on display at the Oriental History Museum were originally owned by Billy and Lucille Truitt, a local watermen and his wife, who amassed a collection of all-things nautical during their lifetime of Oriental living. Today, a number of items from this original collection are still proudly showcased, including a number of model skiffs, oyster scoops, a net pole, various ceramics, and Lucille Truitt's personal paintings of the Oriental area. Signs from the original Red Lee's Oriental Grill hang throughout the museum, advertising hot dogs and hamburgers for $.25. Other local claims to fame on display at the museum include an original menu from Red Lee's Oriental Grill, as well as a National Enquirer magazine from 1995 with the headline "78-YEAR-OLD SELLS BURGERS IN THE SAME PLACE FOR 50 YEARS … and they're still only 25 cents!" 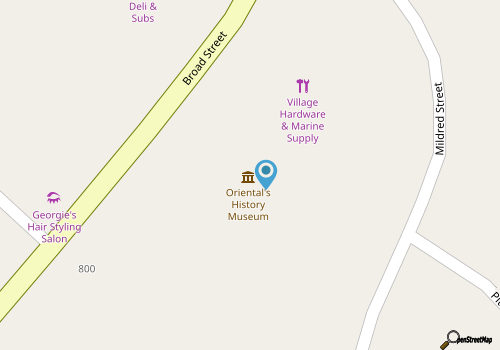 Historic photographs, log books, and pieces relating to Oriental's humble beginnings as a coastal port town, (including a bronze porthole from the "Oriental," the 1860s shipwrecked steamer that gave the town its name), can also be found throughout the small museum. Patrons are free to browse through the historic news stories, local memorabilia, and in the process, can form a personal and detailed account of everyday life in this small community. A small front porch is open to anyone who wants to take a load off, and features brightly colored rocking chairs, hanging fish nets, and a number of outdoor antiques stationed nearby. The museum also has a small gift section which features Oriental Steamer prints, books, and even copies of the original 1995 Enquirer magazine. For an incredible historical journey that covers Oriental's entire legacy, from the shipwrecked vessel it was named after to its infamous local hot spots, a trip to the Oriental History Museum is a must. Small but welcoming, and stuffed with exhibits that will both educate and surprise visitors, the Oriental History Museum is a great example of this coastal town's proud and enthusiastic community spirit.